This is the classic hand wash your dad did in the driveway on saturday morning only better. We start with your wheels/tires and inside of the fender wells with the highest quality degreasers. Then we pre-spot areas that have bugs or road grime on the body of the vehicle. Now it’s time to rock and roll with our high foaming soap with a wax additive. Once clean, we hand dry and air purge all cracks, mirrors and body lines. We finish off the exterior with a tire shine and trim detail. Next your interior is air purged, vacuumed and windows are wiped down. Finally we finish off with a final inspection to ensure quality. This isn’t rocket science, it’s all in the name. We start with the old fashion wash service, then a clay bar treatment to clean and prepare the painted surface for wax. The karate kid would be very proud of us, wax on wax off! This service is perfect for a clean or lightly used vehicle. It includes a hand wash and wax, cleaning of wheels and tires, a mini interior service that includes air purging, a wipe down of the dash, console, door panels, glass and vacuum. To finish, of course tire shine and exterior trim detail. This is the cat’s pajamas and our most popular service we offer. Each vehicle starts with a plan of attack with the client, because everyone treats or uses their vehicle in different ways. We look over the entire vehicle with you so we know what is expected of us. 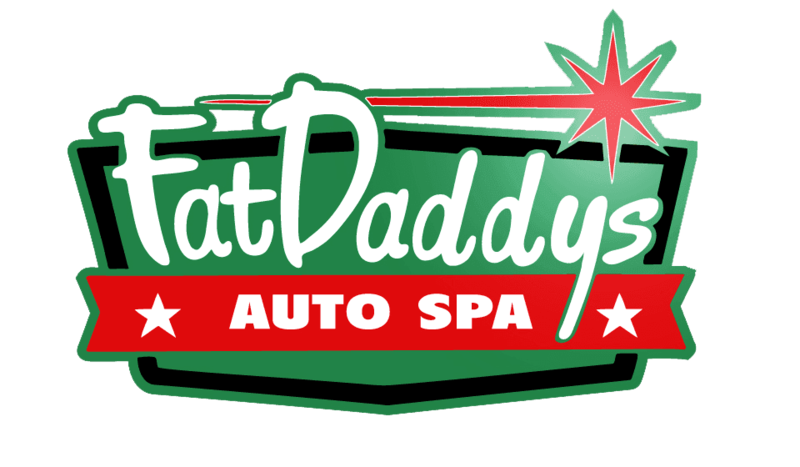 This plan that you the client, and fat daddy’s put together takes out all the guess work of what is in our scope of services and what may need to be out sourced. This is a complete “roof to rims”, “headliner to carpets” and all the visible mechanical parts such as the engine compartment and suspension. Many clients use this service to prepare a vehicle for sale or a vehicle that was just purchased. With such a complete service the only other services we may suggest would be a head light restoration and plasma coat paint protection. Plasma coat has the best durability, gloss and paint clarity on the market. Most sealants need to sit on the paint and haze over time before removal, and after the product is removed it takes 24/48 hours to bond completely to the paint. Plasma coat bonds the instant it comes in contact the paint. Other types of sealers usually last six to eight months, plasma coat last well over a year. Reconditioning and detailing go hand and hand but are to completely different services. This service is for vehicles that have had a very hard life and haven’t been taken care of. It’s the kind of car that would make my grandfather say “you can’t polish a turd.” it’s also a great service for older or classic vehicles that may have beautiful patina under all the oxidation and neglect. They would look like a new penny if it was reconditioned. This is becoming more and more popular with classic car owners that want to recapture the appearance without the high cost of restoring the whole vehicle. There’s nothing worse than sitting in a dirty car day in and day out. Did you know a clean car makes you feel more productive and organized? Vehicle interiors can be tough to clean if you keep putting it off. Plus the condition of an interior can play a huge roll in resale value. We start with the carpets and work our way up. This system of products will not soak your carpets or cloth seats and 99% of the time the interior is dry at time of pick-up. We detail all of the interior components as well, without all that shinny stuff the other guys think is cool. Nothing is left untouched and the trunk is included as well. Doggie hair and sippy cup bandits may be subject to up charge. Is your vehicle a smelly nelly? Many things contribute to odors in your vehicle like smoke, food, animals, cologne, perfume, work contaminates, and bacteria. This service doesn’t mask odors with fragrances or odor bombs. We permanently remove the odor by killing the bacteria that’s creating the odor. This is done with (03) ozone treatments. Don’t be the smelly kid on the block. The total amount of auto thefts for albuquerque nm in 2014 was 4,754. We see many of these vehicles get recovered and believe me they don’t come back clean. Biohazards such as blood or drug paraphernalia and items left behind should be handled by a professional detailer with bio hazard training. We treat stolen recovery vehicles as crime scenes and do a complete investigation to insure your vehicle is returned back to you safe and clean. We work with all insurance agencies. We hope this never happens to you but if it does ask your insurance agency for the best. With all magic solutions on TV for headlight restoration there’s a lot of confusion. It’s simple there’s no short cut. A true restoration is a four step process that removes the dulled layer of plastic and restores the clarity of the headlight, pricing is for the set. Bright lights fat city baby! We use a water based degreaser to clean the top half of the engine and the surrounding components. The degreaser is removed with pressured water. Next we air purge the whole compartment and dress the bay with a low sheen dressing. Some people don’t think twice about how the engine compartment looks but this helps your service mechanic check for leaks, worn belts, and hoses. This simple service could save you from a costly repair later down the road.